This traditional elderberry plus wine recipe was dated 1951 in grandfather’s recipes and records book but I think it may well date from before WW2 as did others in the same section of the book. As the years went on he altered a few details and so have I to improve the result and make more certain a good outcome. It’s a complex wine playing on the base notes from the elderberries. It is just drinkable at six months but far better put away for a year or two once bottle which allows time for the complexity to blend and develop. Strip the elderberries from the stalks, a fork makes this an easier task. Wash well. 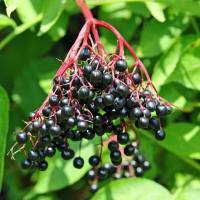 If you immerse the berries in cold water for a few minutes, any hidden insects will float off. Place into a fermenting bin or wine bucket and crush. A traditional potato masher is ideal for this. Boil the water and pour over the crushed berries. Put the lid on the bin and leave for 3 days, stirring daily. Strain into a large pan and add the zest of the lemon, cloves and roughly chopped and well bruised ginger. Bring to the boil and simmer for 10 minutes. Strain back into the fermenting bin or bucket after washing it out, add the sugar and mix well to dissolve it. Then add the juice of the zested lemon. Once cooled to 20ºC or below, add the wine yeast and nutrient. Allow a couple of days for fermentation to slow a little and then pour into a demijohn with an airlock. Produces 5 or 6 bottles of a complex, rich flavoured wine that will be great to drink a year after bottling. I only had half the amount of elderberries, so only half filled a demijohn. It is bubbling away, but will this be ok because the damson wine recipe I am following says to top up to the demijohn neckline with cooled, boiled water, but it only needed about an inch. Talking of which, does the demijohn get topped up with water each time it is racked?